YOUNG New Norfolk footballer Bailey Wheeler is making his mark on the game and looks to have a bright future. 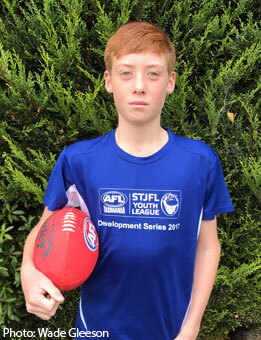 Wheeler, 12, has been selected in the state Under 12 team that will travel to Darwin in August. He plays for the New Norfolk Under 12s in the STJFL. Wheeler has been trying out for the state team for the past 12 months and was thrilled when he got the the phone call with the good news, but it was mum Casey who was over the moon and jumping around the lounge room. "Yeah, Mum was pretty happy," the quietly spoken footballer told me while on his way to watch the mighty Eagles senior teams at Boyer Oval. But, like all things, Wheeler's selection for Tasmania comes at a price - more than $5000 - covering accommodation and flights for himself and his mum, plus uniform and other costs. His mum has already put plans in place such as a raffle to help ease the costs, but is now looking for potential sponsors or donors to help make ends meet. If you are able to help out, you can contact Casey Hack on 0406 909 167. The talented footballer comes from some good footy stock. His grandfather Joey Hack has had a big influence on Wheeler's development and is a former New Norfolk senior player who featured in the club's drought-breaking TFL premiership in 1982. Wheeler's father Luke is having a run in the reserves this year, while mum Casey Hack put her hand up this year and is coaching the Under 8s. Younger brother Taj is in the Under 12 team while elder brother Zac plays for the Under 14s and by all reports is also doing very well. To cap it all off, their two-and-half-year-old sister Ava is the mascot at every game. All three boys wear their grandfathers old guernsey number 11. In the lead-up to the interstate game, Wheeler Bailey is giving his all for the Under 12s each Sunday and also training with the state team to keep his fitness up for what will be his biggest test when he faces off against the country's best footballers. All in the Derwent Valley will wish the youngster all the best and will be keeping a close eye on the team.